Dermal Fillers – rejuvenate and enhance facial features with natural looking and feeling results. It is injected below the skins surface to ‘fill-in’ wrinkles, ‘plump-up’ small areas such as the lips, and ‘re-volumise’ large areas like cheeks. Injectable Muscle Relaxant – a treatment option for those areas where repeated muscle movement is causing your ‘dynamic’ lines to turn into more permanent ‘static’ wrinkles. It is a natural purified protein that targets specific muscles involved in wrinkle formation to make a visible difference, leaving you with a refreshed, relaxed and natural look. 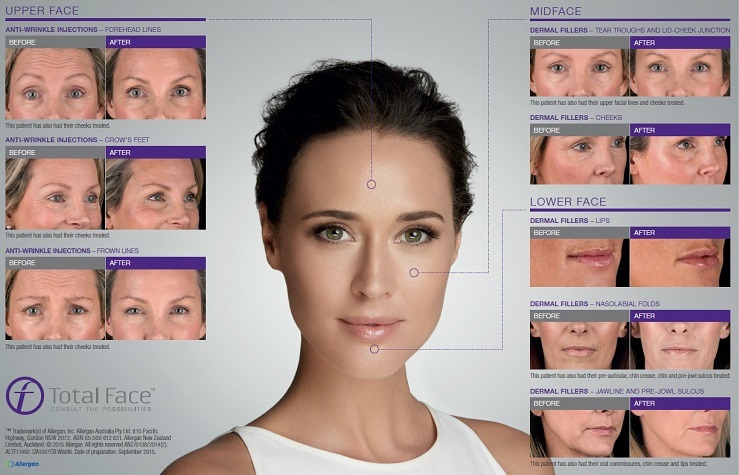 Allergan is a global facial aesthetics franchise offering aesthetic specialty physicians and their patients a comprehensive array of innovative aesthetic products for a Total Face Approach through treatment planning. Allergan's philosophy around treatment planning is to ensure physicians achieve great patient outcomes due to focusing on a step by step approach to rejuvenation to create a very natural looking result. For more information visit a cosmetic clinic for a consultation and discuss your options.